Bracknell Blog: Can the right to strike be scrapped? Ollie Crowmwell who is an independant Conservative blogger who posts at The Reg Rag has written an excellent article called 'It is time to scrap the right to strike and restore the right to manage'. This is in light of the recent British Airways strike and a possible railway signal workers strike. 'Unions cannot have it both ways, they claim to demand the right to strike to ‘protect the workers’ from management imposed changes to terms and conditions but in most cases they seek to use it to force management into changing terms and conditions in their favour. Employment law protects the workers, unions do not, they are often led by politically motivated socialists who in many cases do not even believe in the right of the company to exist and would seek to see it in state hands. I do understand why he believes the market can decide and I also believe that this is a liberal point of view. Workers would still have the right to work to rule. I also believe that its not a good idea for British Airways to have a strike at this time see On the twelfth day of Christmas Strikes. I would also add that British Airways do offer great terms for their employees but their management does seem to be detached from it employees and that appears to be the main problem. Members of staff won't talk about the BA problems on television because they fear for the repercussions on them, this demostrates that there are other fundamental problems. British Airways are also well know for spending money not just on staff but also inefficiently on the whole structure of the organisation and management. However I also agree that this is now a right of workers to join a union and remove there labour on mass for the right reasons. Perhaps if a business is making a loss for example then this right could be held and only used if business are making a profit? But I don't think it is now possible to remove the right to strike. If a government tried to remove this right then they would have industrial action on a scale worse than the miners strike or the strikes in the states during the great depression. Workers who are members of unions would strike against this law before it was introduced and afterwards whether its against the law or not. There would be riots in the streets. It would be against the law for unions to do this as its not related to action by the employer over employee but the people would fight this on their own backs. Unions wouldn't have to call for action but the members of those unions could organise it independently. This could have the surprising effect of causing a new rise of the Left. So for those reasons I would not scrap the right to strike. Todays link is Constantly Furious who swears alot and is very angry about many subjects in this world but he is also very entertaining and not scared of any subject. According to his Political Spectrum Quiz results he is a Far-Right Social Libertarian, figure that out. 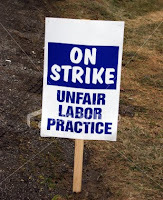 Replace the right to strike with the right to resign immediately.